Shad Jones knows who she is, even if her identity is hard for others to comprehend. The Columbus, OH born emcee is a proud member of the GLBT community, a Christian, and a hip hop artist that emphasizes positivity and growth. If that sounds like a walking contradiction, so be it. With an aggressive and boisterous flow that instantly brings memories of Queen Latifah and MC Lyte – two of Jones’ biggest influences – “Walking Contradiction” is built on a bedrock of solid beats that run the gamut from old-school like “Make Some Noise,” to bombastic club-jams like “Grind Hard Daily” that will keep your head bobbing. The first single, “Magnificent” sets the tone perfectly. Looping horns and staccato drum beats swagger out of your speakers and hold you hostage while Shad Jones and guest MC Drew Love perform linguistic surgery on your mind with effortless skill. The insights gained as a member of the GLBT community inform tracks like “P.O.V. (Point of View)” that preach love and tolerance, and challenge the idea that bigotry and religion are ever compatible. 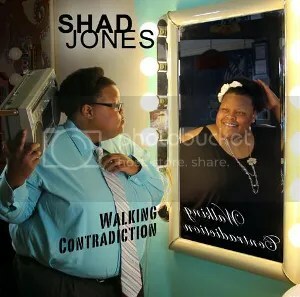 “Walking Contradiction” was released independently in September and is available now at shadjones.bandcamp.com for $10.00.